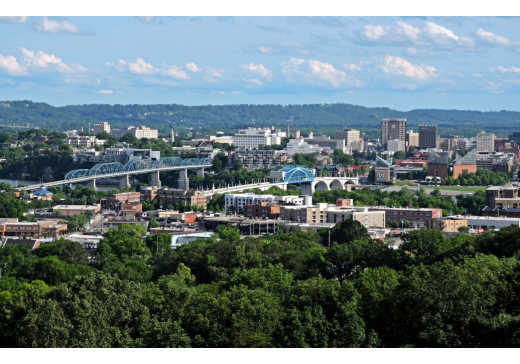 Fortunately for those living in Nashville, there’s a no-brainer option right down the road in Chattanooga, where you’ll find everything you need to create your perfect weekend getaway. Here are our top reasons why the Scenic City makes a great quick escape from Nashville. At just two hours from downtown Nashville, the drive to Chattanooga is exceptionally manageable for a weekend trip. You could easily leave work on Friday evening and arrive in Chattanooga just in time for dinner and drinks. Despite how physically close the two cities are, they really couldn’t feel more different. As you begin the descent off the Cumberland Plateau on I-24, the mountains rise up around you and offer a whole new environment. And while Chattanooga is indeed vivacious, it’s a refreshing notch below the hustle and bustle of Nashville. Whether you love trail running, paddling, hiking, mountain biking, or any other outdoor activity, you’ll find more than enough adventures to keep you entertained during your weekend in Chattanooga. With more than 50 trailheads within half an hour of downtown, even locals don’t run out of places to explore. For a day on the water, rent stand-up paddleboards (or bring your own) and enjoy some time on the Tennessee River, which flows right through the heart of Chattanooga. Paddle around downtown among the liveliness of the riverfront parks, or head into the Tennessee River Gorge for a more tranquil flatwater paddle. If hiking is more your speed, check out the stunningly scenic and well-maintained trails on Lookout Mountain. 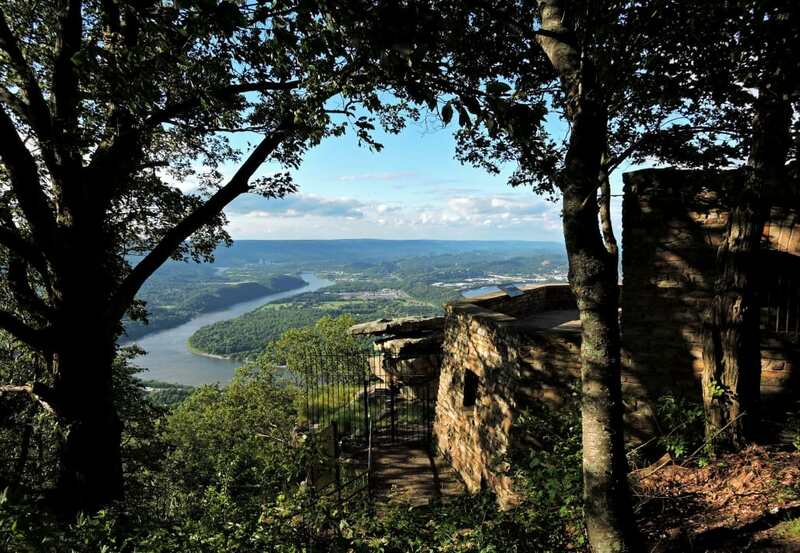 Park at Cravens House and hike up to Sunset Rock, the Bluff Trail, or Point Park for gorgeous views of Lookout Valley. The trails are incredibly well-marked, and they are easy to navigate if you’re not familiar with the area. Mountain bikers will find miles and miles of trails at Raccoon Mountain, 5-Points and Enterprise South, while waterfall lovers will have more than enough to see at Julia Falls, Cloudland Canyon, and Lula Lake. Whatever your adventure of choice, you’ll discover more than enough of it in Chattanooga. 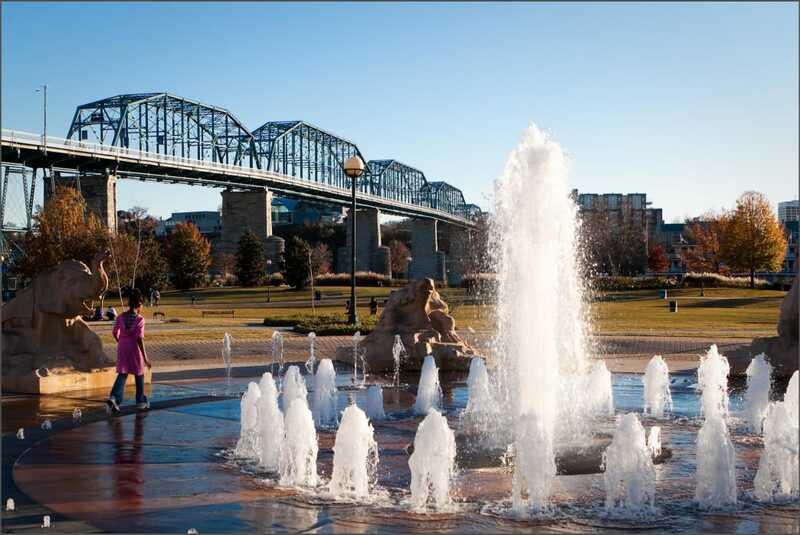 Chattanooga has seriously awesome activities for kids of all ages, ranging from educational to active. Downtown, don’t miss the Tennessee Aquarium and the Creative Discovery Museum. Also nearby is High Point Climbing & Fitness, which has a dedicated kids room with themed rock walls and interactive challenges that your little ones will love. If your family is feeling a little bit daring, take a ride on the Incline Railway and then stop in at the Clumpies Ice Cream Co. after your mountainside adventure. On a sunny day, grab the swimsuits and head for the water fountain at Coolidge Park, where there also happens to be sno-cones, picnic areas, and an antique carousel. Chattanooga is absolutely overflowing with art. From professional galleries to unexpected urban murals, you can hardly round a corner without seeing something that will make you stop in your tracks and pull out your camera. Begin your art tour in the obvious place: the Hunter Museum of American Art. The building itself—part ultra-modern and part colonial—is enough to make your jaw drop. From there, take a stroll through the Bluff View Art District to admire its outdoor artwork and the ever-changing sculpture garden. All throughout the city, you’ll find hidden masterpieces, from the donut wall on the Southside to the chalk alley on NorthShore to the sky-high mural on MLK Boulevard. You’re sure to be continually delighted and surprised by the spectacular (and super Instagram-able) paintings you’ll find at every turn. Getting around Chattanooga is, quite literally, a walk in the park. The city is extremely walkable, and ample parking makes it easy to leave your car and spend the day exploring on foot. 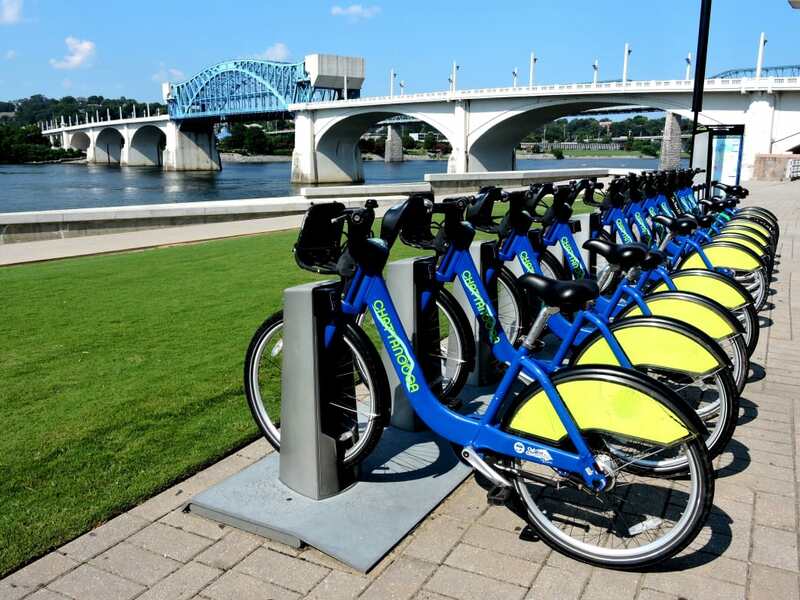 If you prefer a speedier method of transportation, grab a bike from Chattanooga’s easy-to-use bicycle sharing program. With more than 30 docking stations around the city, you can have a blast zipping from one side of town to the other. You can even go for a DIY bike and brew tour and sample local beer all over town. Skip the generic hotel and opt for one of Chattanooga’s more colorful lodging options during your weekend in the city. If you want to keep it low-key but still be in the heart of town, book a night or two at the Crash Pad, Chattanooga’s “uncommon” boutique hostel on the Southside. If you prefer something more luxurious, enjoy a posh night at The Edwin, downtown’s newest hotel. Its elegantly eclectic mood, local touches, and thoughtful amenities offer a uniquely Chattanoogan experience. For a serene, off-the-beaten-path experience, explore the many houses and cabins from Chattanooga Vacation Rentals. They offer beautiful waterfront views, wooded paradises, and even pet-friendly options. No matter where you stay, you’ll enjoy a unique weekend away while exploring both the outdoor beauty and urban charms of Chattanooga—and you’ll discover that the nickname Scenic City is well-earned.